Birthday Sale: 10% off until 30 April 2019. Prices shown before discount. Prices displayed before discount. Mexico City - the country's buzzing capital. Palenque’s atmospheric Mayan ruins in the heart of the jungle. The top of Uxmal’s grand pyramid rewards you with a breathtaking view. 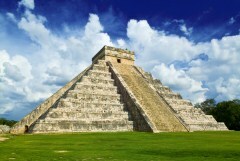 Chichen Itza, the most famous of Mexico's Mayan ruins. Add your spin to the tour and fly from Palenque to Villahermosa on Day 5. Extend your beach time relaxing on the Mayan Riviera. Extensions can be offered in Cancun or Playa del Carmen. Consider spending additional time in Tulum to explore its surroundings including some impressive cenotes and the Sian Ka'an Biosphere Reserve which is inhabited by countless plant species, bird and animals. Enjoy another day or two in Merida and explore the bird watching sanctuary of Celestun which is home to pink flamingo along with a variety of other birdlife and reptiles. Welcome to Mexico City! You will be met our representative and transferred to your hotel. Spend the evening wandering the neighbourhood and treat yourself to delicious Mexican cuisine and cocktails! After breakfast, your guide will await you outside your hotel to begin the tour of magnificent Mexico City. Built by the Spanish on the ruins of Tenochtitlan, the old Aztec capital, the city's historical heart is its vast central square, or El Zocalo. You will visit the Metropolitan Cathedral, which is the largest church in all of Latin America. Drive along the famous boulevard Paseo de la Reforma, built during the short-lived reign of Emperor Maximilian to connect the main square and his castle in Chapultepec. *Please note that the Museum of Anthropology is closed on Mondays. 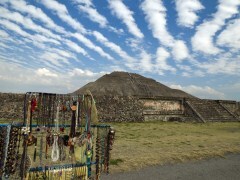 Located 50 kilometres northeast of Mexico City are the 'must-see' archaeological ruins of Teotihuacan - the site of the massive Pyramid of the Sun and Pyramid of the Moon which dominate the skyline of the complex. This was once the country's biggest ancient city and capital of the Aztec people, who ruled over the largest empire in the pre-Hispanic era. Guarded by mountains, this magnificent city is thought to have been founded early in the 1st century AD and reached its peak around 500 AD, when its influence extended down to Guatemala and as far north as present-day Texas. With the help of a local guide, you will have time to stroll down ‘The Avenue of the Dead’, uncover its many wonders and imagine what life must have been like nearly two thousand years ago. You will also visit the Basilica de Guadalupe, Latin America’s most revered religious shrine, where the Virgin of Guadalupe is said to have appeared before an Indian named Juan Diego in 1531, and an image of her was miraculously emblazoned on his cloak. You will have time to explore the New Basilica de Guadalupe (the Old Basilica, built in 1700, is slowly sinking) and to see Juan Diego’s cloak. 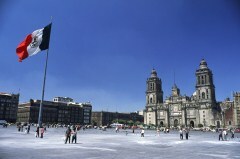 After the exploration, return to Mexico City in the afternoon to enjoy an evening at leisure. A representative will pick you up from your hotel and transfer you to Mexico City airport for your departure flight.On arrival to Villahermosa airport, you will be met by a representative and transferred to your hotel in Palenque. This afternoon, you will visit the archaeological site of Palenque, a World Heritage Site, located 7km outside of the town of Palenque overlooking the swampy plains that stretch northward all the way to the Gulf coast. 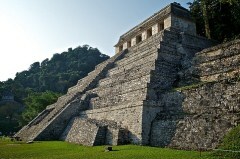 Palenque flourished between AD600 and 800, when its influence extended throughout the basin of the Usumacinta River. The site, surrounded by rainforest where toucans and howler monkeys live, is made up of some five hundred buildings spread over 15 sq km, of which only a few have been excavated. You will explore the magnificent ruins, including the Temple of the Inscriptions – the tallest and stateliest of Palenque’s buildings, the Temple of the Sun – crowned with a prominent roof comb, The Palace – with its maze of corridors and rooms, and many other beautiful buildings. After breakfast, you will be picked up at your hotel by a representative and transferred to Campeche. On the way, stop at the Natural Reserve of Laguna de Terminos and as you reach the smalling fishing village of Isla Aguada, enjoy a 1.5 hour boat cruise through the lagoon. Keep an eye out for dolphins and manatees! Stop at an Island in the Lagoon and see the local flora and fauna. 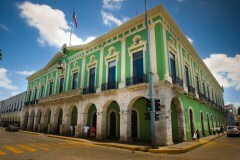 Continue to Campeche and join a walking city tour of the historical centre. 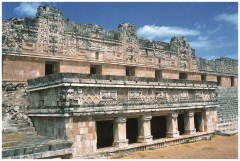 In the morning, you will visit the archaeological site of Uxmal, a World Heritage Site, located 80km south of Merida. Its architecture is characterised by low horizontal palaces set around courtyards, decorated with a profusion of symbolic motifs and sculptures depicting the long-nosed rain god Chaac. You will explore the magnificent buildings, including the Nunnery, the House of Turtles, and the House of the Magician, which dominates the site. After, continue to Kabah with its amazing Palace of the Masks, covered in nearly three hundred masks of Chaac, before returning to Merida. You will also see many other beautiful temples. 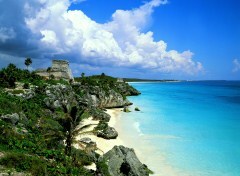 From Chichen Itza, head to the white sandy beaches of Tulum, where you will enjoy a day at leisure. Today you will complete your trip and be transferred to the airport in Cancun or if you are extending your trip, your guide can transfer you to selected resorts in the Riviera Maya including those located in Cancun or Playa del Carmen.